One of my dear friends is getting ready to have a sweet baby girl. Our close group of girl friends are busy planning her a baby shower to celebrate. I have been working on some super cute decorations that I will show you later this week. Today I created a super cute printable to match baby Sofia’s owl themed nursery. All I have to do is put it in a frame! More than likely this gift will double as a baby shower decoration as well. Didn’t it turn out so cute?! I am offering this printable, free of charge, to all of my lovely readers. I ask that this printable is for personal use and not monetary gain. If you would like to share this printable with your readers, please be sure to link back to Mine for the Making. To print: Just click on the image so that it appears in a new window. Click on it one more time so that it is it’s true size. Then right click and save to your computer. You can purchase a printable without the watermark in the bottom corner for $3.00. Just send me an email at MinefortheMaking(at)gmail(dot)com. So cute, Kara!! I can’t wait to see the rest of the decorations! Very cute Kara!!! I love the colors. :) I’m looking forward to the rest of the shower decorations! L-O-V-E This!! I look forward to seeing maaaaaaaaannnnnnnnnnnnnyyyyyyyyyyyy more printables from you!!! This is so cute! 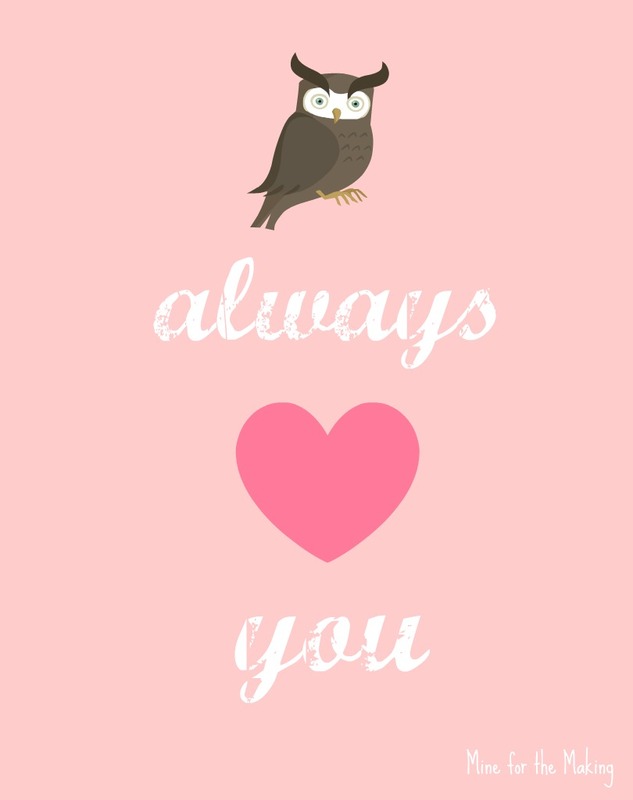 I’m forwarding this to my friend whose daughter’s room is pink and brown owls…she’ll be thrilled. coming out with some amazing stuff. I shared this on my FB aand my followers just loved it.